XCell Compiler also known as XLS to EXE converter offers very easy and hassle free conversion Excel workbook to EXE file. You can convert Excel workbook (XLS, XLSX, XLSM, XLSB file) into EXE application with securely protected formulas in binary format and strong protected VBA code. With registration/license management feature you can protect your compiled Excel workbook from illegal copying from one computer to another by using hardware locking mechanism. 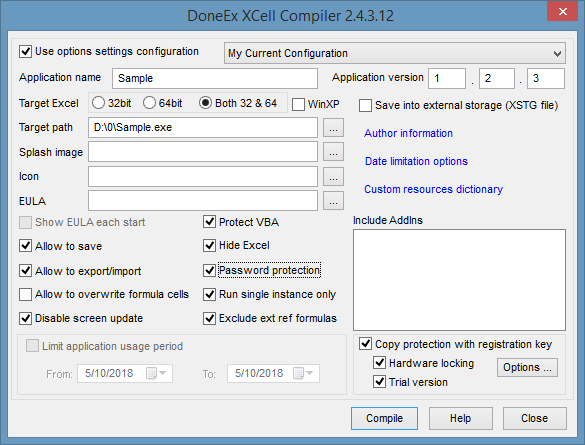 Please try the XCell Compiler Free Trial version which is completely functional for workbook formula protection, VBA code protection and calculation. Securely protect formulas by convert them into binary format. Without this feature any kind of Excel file copy protection is useless. Convert Excel workbook (XLS file) into an application (EXE File, which requires Excel to run). You do not need to be a programmer to use the product. The strongest VBA code copy protection. Create registration key/license based application. Prevent illegal copying from one computer to another. Hardware locking! Allow your XLS to EXE converted applicaiton to work on target computer only. Create Trial/Demo of compiled Excel workbook limited by amount of days and trial version nag window. Apply to a XLS to EXE converted file copy protection with Matrix Dongle. Export/Import changed data from/to compiled EXE; Import data into original Excel workbook. Royalty free distribution of your XLS to EXE converted EXE, which doesn’t require any preinstalled Run-Time libraries. The original Excel workbook stays without any changes after compilation. Restrict the time period of usage for your XLS to EXE converted Excel workbook. License expiration warning. Add your own customized expiration message. Add your own End User License Agreement (EULA) information. The compiled Excel workbook will not be started until the end user accepts the EULA. Save changed data directly into compiled EXE or into external data storage and keep the EXE file unchanged after saving. Add your own application name, version and copyright information. You can add your own splash screen, while compiling. This will give you a chance to advertise your own company name. Install your Add-ins (XLA files) on your customer's computer. Restrict the access only to authorized individuals, and limits users' activities to the minimum required, for business purposes.